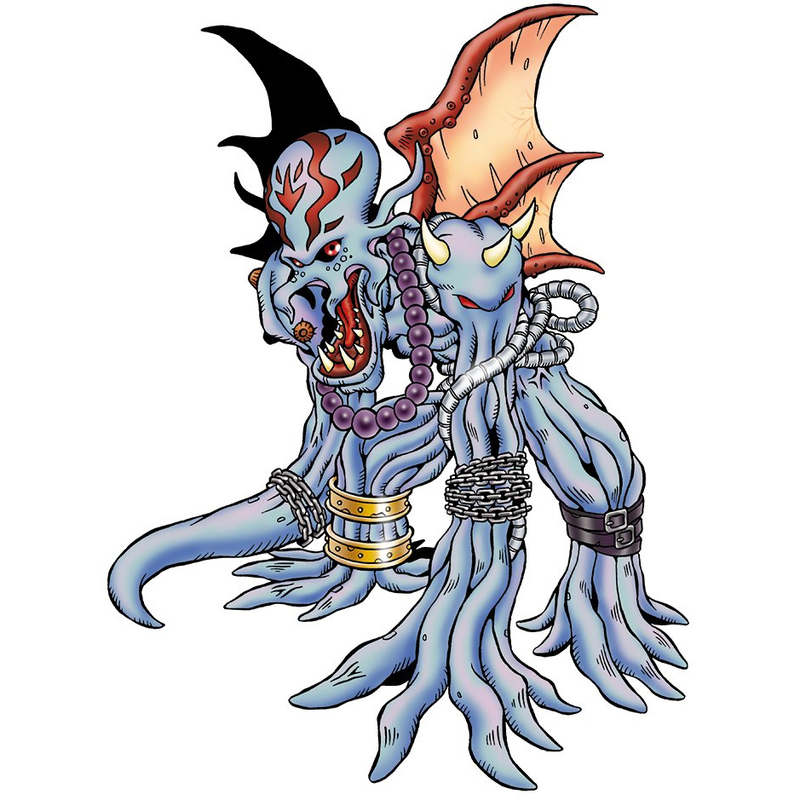 An evil god Digimon called the "Sinful Priest of the Ocean Floor". It is thought to have evolved from a computer virus that would infect the computers aboard ships and the like, then knock their direction and course out of order. 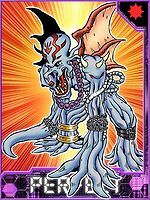 It bundles up its innumerable, multiplying tentacles and takes on a humanoid appearance, but its natural shape is a strange evolution of a Mollusk Digimon. Its Special Move is throwing its trident, with tremendous physical strength (Forbidden Trident). For its defeated opponents, it wears a rosary around its neck, and adopts a pose similar to mourning. Title: 「海底の破戒僧」 — "Sinful Priest of the Ocean Floor"
From Dagon 「ダゴン」, one of the two rulers of the Deep Ones in The Shadow Over Innsmouth by author H. P. Lovecraft. This character is inspired by the Dagon, a god worshipped by the Philistines, represented as half man and half fish. n., Likely derived from Dragon. 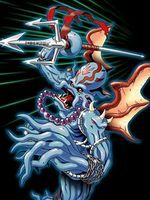 Anime/Manga Digimon Adventure 02: "The Call of Dagomon"
Dagomon's design derives from the Cthulhu, a fictional cosmic entity that first appeared in the short story "The Call of Cthulhu". 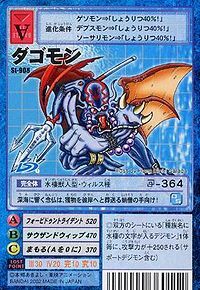 フォービドゥントライデント Fōbidun Toraidento Forbidden Trident/Tentacle Claw Uses its arm energy to throw its three-pronged spear. 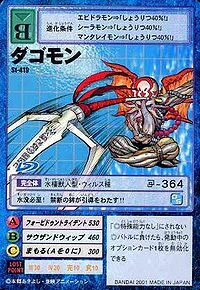 サウザンドウィップ Sauzando Wippu Thousand Whips Whips the opponent with its infinite tentacles. A mysterious Dagomon is seen rising from Dagomon's Ocean. Dagomon evolves from Octmon with 0+ DP. Evolves to Pukumon with 0+ DP. Dagomon can be found at the Amaterasu Oceans. Dagomon technically doesn't appear in Cyber Sleuth, however the ghost of the dead school girl who the Inoden Occult Research Club, Aiba Takumi/Aiba Ami and Kuremi Kyoko accidentally summon from another realm is revealed in Digimon Story: Cyber Sleuth Hacker's Memory to be a Dagomon in disguise by Douguchi Lily and Amazawa Keisuke. Dagomon is also available as a Digimon Medal. 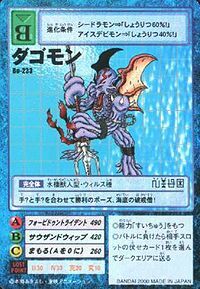 Dagomon is #173 and is a Water Virus Type, Perfect level Digimon and uses 12 memory. It evolves from IceDevimon, Coelamon and Raremon and can evolve to Neptunemon, Ebemon and Leviamon. 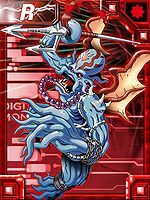 Its special attack is Forbidden Trident and its support skill is Deep Sea Slumber which gives all attacks a 10% chance of putting a Digimon to sleep. Douguchi Lily hires Amazawa Keisuke to help her deal with a "ghost" that she and her friends in the Inoden Occult Research Club (and also Aiba Takumi/Aiba Ami and Kuremi Kyoko) accidentally summoned from another realm, which is supposedly the ghost of a girl who killed herself by jumping in front of a truck. Lily claims to be a spirit medium, meaning she has the ability to send the ghost back to where it came from but doesn't want any of her friends to know. They track down the ghost in Shibuya, though suddenly countless copies of her appear. After chasing down multiple of them, they find the original one, which reveals itself to be a Dagomon in disguise and alongside Lily's Kyubimon, which was originally her "familiar", which her shocked to see it now being a Digimon, defeat the Dagomon. It escapes into the Shibuya underground however and has to be chased again, with more impostors on the way. They find the real one again and after Kyubimon evolves into Taomon they defeat the Dagomon once again and send it back to where it came from. 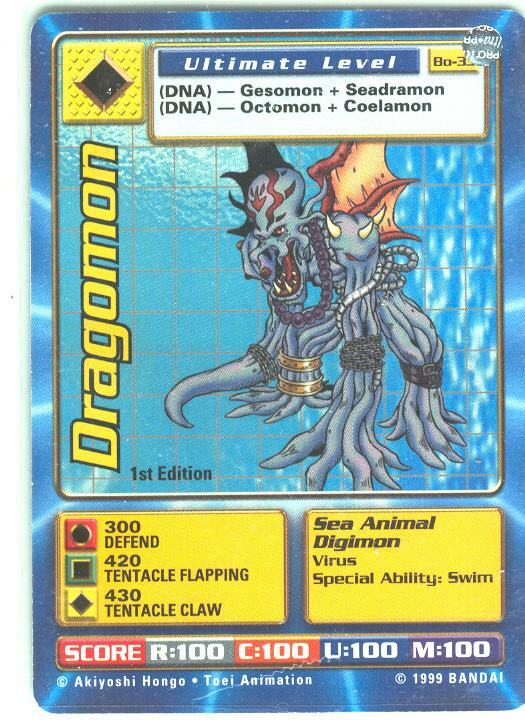 Obtained by Jogressing Seadramon, Coelamon, Gesomon or Octmon with a compatible Digimon. Can Jogress to Pukumon with a compatible Digimon. Obtained by Jogressing Seadramon, Ebidramon, Gesomon or Octmon with a compatible Digimon. Can Jogress to Pukumon with a compatible Digimon. Evolves from Aquilamon, Blade Kuwagamon, Coelamon, Greymon X-Antibody, Liamon, Pegasmon, or Revolmon. 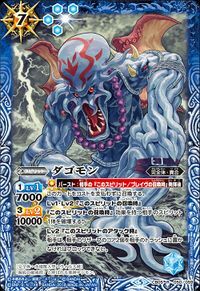 Can evolve to Metal Etemon or Tyrant Kabuterimon. Dagomon is an unobtainable Leader Digimon. Drowning is inevitable! Its forbidden trident will pass the final judgment!! This octopus monk offers its prayers which resonate deep within the ocean, sending its prey off to the otherworld! It sends its battle opponents to hell! It puts its hands (?) together in a victory pose, the commandment breaking priest of the deep! 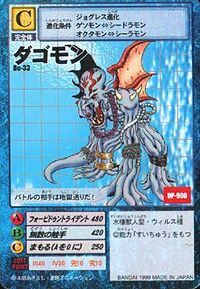 An evil god Digimon called the "Sinful Priest of the Ocean Floor".